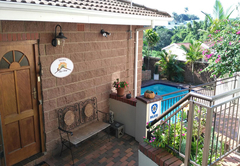 Lily's Cottage is a highly recommended property providing self catering in Queensburgh for up to 4 guests visiting the Durban region. 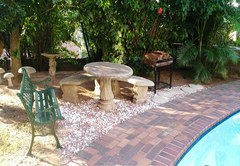 Sleeping six, Lily’s Cottage is a charming spacious two bedroom self-catering cottage in the quiet suburb of Queensburgh. There are a number of shopping centres just around the corner (2km). 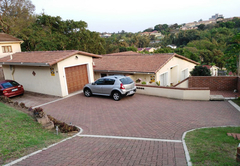 We are centrally situated between Durban and Pinetown. 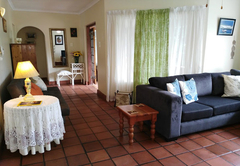 The spacious cottage (suitable for four adults and two children), consists of a fully equipped open plan kitchen with walk-in pantry, breakfast nook, lounge and two comfortable bedrooms. 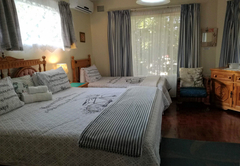 The large main bedroom is set up as a family room with a double and a ¾ bed. The second bedroom is furnished with a double bed and there is a double sleeper couch in a common area between the lounge and bedrooms. The main bedroom has an en-suite bathroom (bath, shower and wash basin) and there is a separate toilet and wash basin. 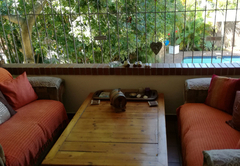 The house has a large secure balcony overlooking the swimming pool which is exclusively for guests and there are private braai facilities. 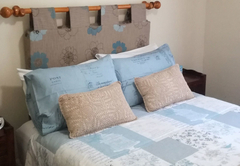 Complimentary tea and coffee supplies, shampoo and soap plus all bed linen and towels are provided. 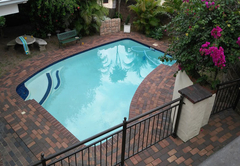 A daily cleaning service is also provided and there is secure parking available. 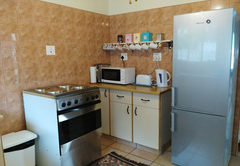 Laundry facilities are provided in the main house. Many of Durban’s famous attractions are a mere 15 - 20 minutes away: Durban’s golden beaches, uShaka Marine World, Moses Mabhida Stadium, Growthpoint Kings Park, Sahara Stadium Kingsmead, Kings Park Swimming Pool, Athletics Stadium, Durban ICC, Exhibition Centre, Durban Country Club, Greyville Racecourse, Wilson’s Wharf, Westville Pavilion, University of Kwazulu Natal and Inkosi Albert Luthuli Central Hospital. 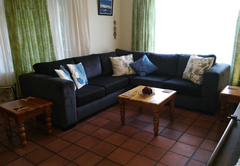 The large main bedroom is set up as a family room with a double and a ¾ bed. 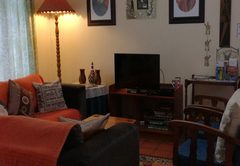 The second bedroom is furnished with a double bed and there is a double sleeper couch in a common area between the lounge and bedrooms. We enjoyed every minute of our stay, We would recommend to any one. May God Bless that couple.